Sometimes I actually plan a project – draw a sketch, figure out yardage, audition fabric – and think putting it together will be a slam dunk. Well….hah! I’m wrong on my latest effort. To back up, I was taken by a subtly colored circle quilt called Whisper in “Transparency Quilts” by Bill Kerr and Weeks Ringle. 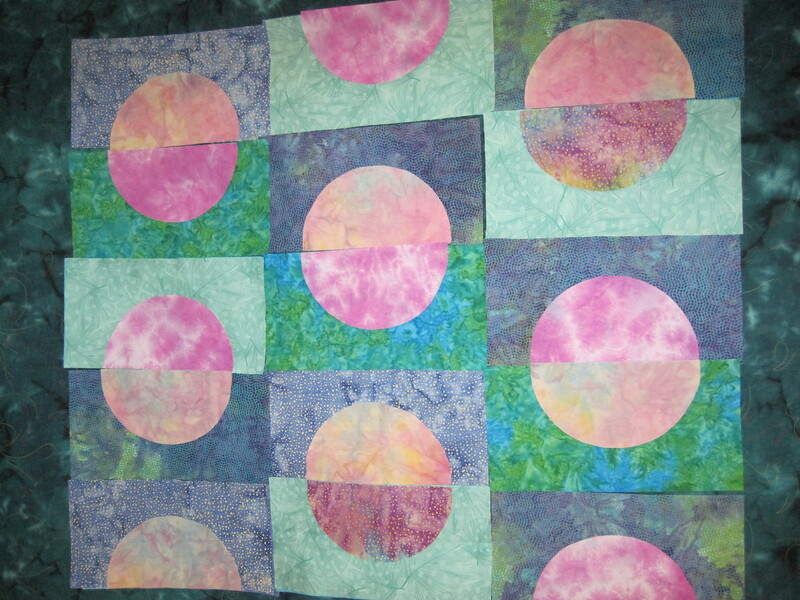 Recently I’ve had a serious thing about circle quilts and have collected several patterns and ideas for making a few. I even own a book on circle quilts and some strange pop out plastic forms for making drunkards path blocks. Here’s one I love called Gellato Circles. And here’s one that was shown at the 2012 Cincinnati International Quilt Festival. Kerr and Weeks used lovely Cherrywood solid fabrics. I planned to use batiks I’d been setting aside for some months. Mine was going to be less subtle than theirs, but my taste in colors is usually not subtle. You may have gathered that already from the pictures above. I laid out all my fabrics and started eliminating ones I didn’t think would work. I was left with a blue/green and magenta palette. So far, so good. Then I made templates of the half circles needed and started cutting out the fabric. Again, things were going along swimmingly. Then the wheels came off. My original plan was to have my darkest background colors on the outside and have the background become lighter towards the inside. The circle colors were to do just the opposite, with the lightest on the outside and the darkest on the inside. I laid out my cut pieces and it just didn’t look right. The color gradation wasn’t graded enough and my circles (made up of 2 half circles) had too much contrast. What to do? Throw out all that planning and start moving pieces around was my solution. The top is now a lot smaller and is actually subtly colored, for me. I’ll be fussing with it this coming week.